The Old Catholic Church of Great Britain (originally named the English Catholic Church) was formed in 1968 by three bishops: Nicholas Patrick Collins, Donald Garner and Aelred Peter Distin. The basis for the church was the Constitutions issued by Archbishop Joseph-René Vilatte. In August 2012, Archbishop John Kersey of the Apostolic Episcopal Church succeeded to the Primacy of the church as titular Archbishop of Elmham. The three founding bishops were all men of the working class who were drawn, as were others of their ilk, into the active Old Catholic movement that existed in London in the 1960s and that centred upon such figures as Archbishop Wilfrid Andrew Barrington-Evans (1903-71) of the Old Roman Catholic Church. Barrington-Evans’ church adopted the social gospel movement and began a ministry to those on the margins of society. A mission to the homeless was allied to care for those who had fallen on hard times, including those in prison. Barrington-Evans, who was a bank manager in secular life, became known for his willingness to offer “rough diamonds”, including ex-prisoners, a second chance, and a number of those ordained by him went on to rebuild their lives and undertake a socially useful ministry. He maintained high standards of training for his clergy, who were mostly men without the advantages of formal education and who would have been debarred from entry to the ministry of the mainstream churches as a result of their backgrounds. While orthodox, his church also took a gentler pastoral stance towards men who had been convicted of homosexual offences, which were still criminalized at that time. Barrington-Evans correctly judged that there were areas of ministry that were then being neglected by the (Roman) Catholic Church or where its priests would not find themselves welcome. Although his church attracted negative press publicity on account of the backgrounds of his clergy, this also served to attract greater attention to it from those interested in its work or in offering their vocations. John Nicholas Collins, known in religion as Nicholas Patrick (pictured left at his consecration in 1966), held the academic degrees of Master of Arts and Doctor of Philosophy and was a teacher in secular life. However, like others of the Barrington-Evans fold, his past misfortunes made him a prime candidate for the “church of the second chance”. He had been ordained priest by Barrington-Evans on 24 June 1961 and was later a member of the Synod of the Church, but was excommunicated by him in March 1964 for offences against ecclesiastical discipline. At this point, he was living in Streatham. On Easter Day 1965, the Old Roman Catholic jurisdictions of Barrington-Evans and Archbishop Geoffrey Peter Paget King were united. Collins was part of a group of clergy and former clergy of these churches who rejected this union – or in some cases had been rejected from it – and in a Deed of 14 March 1965 placed themselves under Archbishop Gerard George Shelley, the original Primate of the Old Roman Catholic Church in Great Britain, who had been at odds with Paget King since 1961 and now saw the opportunity to reconstitute his jurisdiction. Within a short time, however, internal dissent had led to the breakup of this new group. Collins now made contact with the inspirational and mystic Frenchman (St.) Tugdual I (Jean-Pierre Danyel, 1917-68). Tugdual was a former hermit living in Saint-Dolay, Brittany. In 1956 he was blessed as Abbot of the Order of St Columban by Irenaeus (Charles Maria Joseph), Comte Poncellin d’Eschevannes (1886-1970), Bishop of Arles in the Eglise Gallicane (he would become that church’s Primate in the succession of Archbishop Vilatte in 1967). He was now charged with the mission of the revival of the Holy Celtic Church (Sainte Eglise Celtique), drawing upon the Celticism that was still very strong among the Breton people. As a result Tugdual was consecrated on 5 May 1957 by Irenaeus assisted by Archbishop Julien Erni (1895-1984) of the Ligue Oecumenique pour l’Unité Chrétienne and Eugène de Baczyna-Batchinsky of the Ukrainian Orthodox Church in Exile, as Mar Tugdual I, Bishop of Redon for the Holy Celtic Church. He became abbot of the monastery of Saint Dolay, which survives today under the Celtic Orthodox Church. On 15 August 1966 Tugdual consecrated Collins assisted by two of his bishops, Auguste Suliac Monier and François Chelian. Equipped with this new authority, Collins returned to London and set about establishing a mission. Before the 1965 union, Barrington-Evans’ body had used the subtitle The English Catholic Church, and (after initially calling his church The English Old Catholic Church), Collins adopted the same name and the titular see of Camden, later changing this to Faversham after Bishop Donald Garner, who had held the same titular see in a different denomination, joined his church. However, Collins’ life outside the church had meanwhile taken a darker turn once more, precipitating a series of events which would lead to his sudden death in June 1969. At some point shortly before his death he received conditional consecration from Guy Claude Hamel (Patriarch Claudius I) (1935-2008), who was head of a branch of the Old Roman Catholic Church in Canada and who had been appointed as Chancellor for the Canadian Regions by Archbishop Richard Marchenna of the Old Roman Catholic Church based in New York. Donald William Garner (1914-81) had been consecrated on 30 July 1967 by Archbishop Charles (Ignatius Carolus) Brearley of the Old Holy Catholic Church assisted by Anthony Walter John Williams as Brearley’s Bishop of Camden. Brearley’s church organization was somewhat loosely constituted and Garner soon found himself working independently. Garner accepted office as titular Bishop of Tewkesbury in the English Catholic Church towards the latter part of 1968. Terence Coghlan Distin (in religion Aelred Peter Benedict) (1938-2007) was born in Luton, the son of an engineer’s clerk. Throughout his life he sought to pursue an idiorrhythmic Benedictine monastic vocation. He was ordained and then consecrated on 21 April 1968 at the chapel of St Benedict’s Convent, Manor Road, Brighton, according to the Roman Pontifical, by Garner acting solus. When he and Garner came into union with Collins later that year it was decided that he should be conditionally re-ordained to all orders by Collins. He received the subdiaconate and diaconate on 11 December 1968, and the priesthood on 14 December 1968. He was then consecrated on 15 December 1968 by Collins assisted by Garner and assigned as Titular Bishop of Lindsey. All these ceremonies took place at the Priory Chapel of St. William, Richmond, and used the Ordinal of the Liberal Catholic Church. The instrument of consecration specifically acknowledged his earlier consecration by Garner. Fr. Ian Kirk-Stewart (later Primate of the Reformed Catholic Church) was present throughout, and Fr. John Kingswood was also present at the consecration. Distin at around this time established and became Superior of the Order of the Atonement. During 1969 the name of the church was changed to the Old Catholic Church of Great Britain as a result of an intercommunion agreement with Hamel’s Canadian body. This was disrupted by Collins’ death and Hamel’s own vicissitudes, and by the early 1970s Distin was the sole bishop remaining of the church. In 1973, Garner together with bishops Rupert Pitt-Kethley (Mar Rupertus, 1907-75) and Richard Kenneth Hurgon (Mar Dominic-Benignus, 1902-94) formed the English branch of the Reformed Catholic Church (Utrecht Confession), which became one of the more active of the smaller churches during this period. Relations between Distin and this church continued until at least the death of Garner in 1981. Distin was a complex and at times difficult man. He was highly motivated and intellectually able, warm and passionate about those he loved as well as his religious convictions. However, he suffered from an unusual level of physical restlessness, and his later years were troubled by ill-health. He was constantly moving house, sometimes more than once in a year, and lived at various points in parts of London, East Anglia, and Hertfordshire. His final home was a flat in Hackney, east London. This inability to settle was matched by the spiritual quest that saw him pass through a number of denominational affiliations in addition to his primacy of the Old Catholic Church of Great Britain, and the preference for the use of different religious names at different times of his life (perhaps reflecting particular emphases on the saints concerned). He was forever in search of what was just beyond his grasp. Having lived through the serious and damaging scandals that had affected the Old Catholic movement in the 1970s, but from which he had managed to keep his distance, he was nevertheless fearful of the attentions of the tabloid press, which was not then always known for its accuracy and fairness in reporting Old Catholic matters, and this compelled him to keep a relatively low profile. In 1993, Distin allied himself with the Independent Catholic Church in Great Britain under the controversial Archbishop John Christopher Simmons (1945-2003). Simmons regarded Distin’s earlier ordinations as problematic and required him to undergo subconditional consecration at his hands. This took place on 30 May 1994 at his house chapel in Singleton, Ashford, Kent. In late 1998 the last of a series of breaches occurred, and Distin returned his certificate of conditional consecration to Simmons as an act of protest. Also in 1993, Distin established the Benedictine Order of St Romuald as a dispersed order with eight brothers and one sister. The Order was disbanded by Distin in 2004 as a result of lack of support from its members. It was re-founded in 2007 by Distin’s successor Dom Phillip Kemp and continues today under Abbot Thomas Hugh Bodkin OSB(csr). Meanwhile, in 2006, Distin planned to establish an Order of St Gilbert of Sempringham (also referred to as the Order of St Gregory) on an ecumenical and Augustinian basis, but this had not happened by the time of his death. This was not related to the Order of the same name under the late Archbishop Dennis C. Green, which by then had become the Order of Ss. Dionysis and Paul. In 1997, a community of three monks came into possession of a redundant convent in Grangetown, Middlesborough, Yorkshire, and organized themselves as a traditional Benedictine community under the name of the Monastery of Our Lady and St Cuthbert. The local Roman Catholic bishop was not prepared to support the community, and so Distin offered to help. On 20 March 1999 he ordained the leader of the community to the priesthood and continued to provide episcopal oversight. In 2000, as a result of criminal damage to the monastic buildings, the community removed to Skelton where it occupied two terraced cottages. The monks were reported some years ago to be serving the parish of St Ninian in nearby Whitby, as well as undertaking work with the homeless and the local health service. Distin’s transitory life did not allow for the building up of a fixed body of clergy, but nevertheless he did consecrate a number of bishops for independent ministries. Towards the end of his life he made a more determined effort to establish the jurisdiction on a firmer footing with the aid of Dom Phillip Robert Kemp OSB(csr) (1965-2012) and Dom Simon David Scruton OSB(csr) (1982-), both of whom were ordained priest on 19 October 2003, Scruton being appointed Vicar-General of the Northern Province. In these last years it became apparent that Distin perceived no difference between his status as a bishop who happened to be of the Old Catholic obedience and that of a bishop of the Roman Catholic Church. He attended Mass at Westminster Cathedral wearing his Benedictine habit, and described himself to others as a Roman Catholic. He also accepted and used the Novus Ordo of Pope Paul VI. Whatever divisions existed between him and the Holy See were of a logistical and bureaucratic nature in his understanding, and were not of the esse of the faith. In addition, a relationship was developed with the Christ Catholic Church International, headquartered in Canada, that led eventually to a declaration of intercommunion. Phillip Kemp was for twelve years employed at the Department of Work and Pensions, where he rose to become a manager. He then became a learning and development officer, and latterly Regional Manager, for the public service trades union Unison. An able chef, he served for eight years in the Territorial Army Catering Support Regiment, Royal Logistics Corps, and was promoted from the ranks to Second Lieutenant in 1992. Further promotion to Captain followed before he left the T.A. in 1998. Although he had not pursued university education after leaving school, he studied later in life with the Open University. Kemp was consecrated by Distin as Titular Bishop of Elmham on 6 June 2004 and appointed additionally as Co-Adjutor Metropolitan. On 13 September 2004 Distin formally retired as Metropolitan Archbishop of the OCCGB in favour of Kemp. For a time Distin was happy with this arrangement, but relations then deteriorated significantly to the point where mutual excommunications latae sententiae occurred on 15 August 2006. Distin then attempted to incardinate with a denomination in the United States, but this came to nothing. Having entered hospital for what he told others was to be a routine procedure, he passed away unexpectedly there on 30 August 2007. Under Kemp, the OCCGB was regularized and registered as a charity. Undergoing several changes of name, it was latterly known as the Traditional Catholic Orthodox Church. 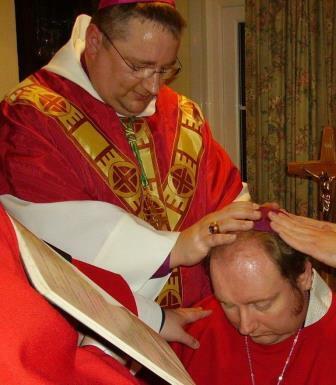 Ecumenical links were pursued, and in November 2006, Kemp ordained and consecrated Archbishop John Kersey, subsequently of the Apostolic Episcopal Church, to the Major Orders of deacon, priest and bishop. Archbishop Kersey conditionally ordained Scruton to the priesthood on the same day. After this event Kemp adopted the additional style of Mar Francis. On 19 August 2006 Kemp had blessed Scruton as Abbot Nullius of Lindsey of the revived Benedictine Community of St. Romuald under the name Aelred Peter II; Scruton would retire from this office on 30 August 2008. Plans were made to acquire a redundant church to be used in worship, but these did not come to fruition. Kemp died suddenly on 10 July 2012 at the age of 46 as a result of heart disease. He is buried in his home town of Hull. Following his death, the Administrator of the jurisdiction requested that Archbishop Kersey, as the senior of the two bishops consecrated by Kemp, should succeed him. Pectoral cross hand-made in stainless steel by Archbishop Distin, who was a skilled metalworker, to commemorate the third millennium, and presented to Archbishop Kersey upon his consecration by Archbishop Kemp.